We think the best Ram ProMaster City is the most basic one, so go easy on the options. The 2018 Ram ProMaster City is a commercial van that offers plenty of capability for small-business buyers. Two different ProMaster City bodies—Tradesman cargo and passenger wagon, each of which is offered in base and SLT trim levels. This year, the only change of note is a newly standard rearview camera and an upgraded audio system. 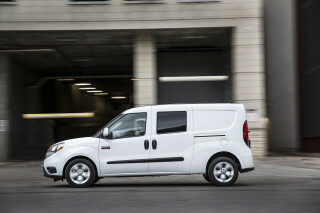 All versions of the ProMaster City use a 178-horsepower 2.4-liter inline-4 engine that shuttles power to the front wheels via a 9-speed automatic. Dual sliding doors provide good utility, but the ProMaster City is definitely a light-duty commercial-oriented van compared to the larger ProMaster. The ProMaster City squares off against the Nissan NV200, Chevrolet City Express, Ford Transit Connect, and Mercedes-Benz Metris. It slots right in the middle; more powerful than the Nissan and Chevy Twins, but not quite as large or flexible as the Transit Connect and Metris. With a maximum payload of up to 1,883 pounds and 131.7 cubic feet of cargo capacity, the ProMaster City is sized right for plumbers, florists, and other commercial users who might be downsizing from a worn-out Ford E-Series or are looking to cut fuel bills across their fleet. There’s even a taxi configuration option. In our eyes, the ProMaster City that makes the most sense is the least-expensive model. The SLT trim, with its painted bumpers, upgraded cloth upholstery, and standard navigation can get pricey. 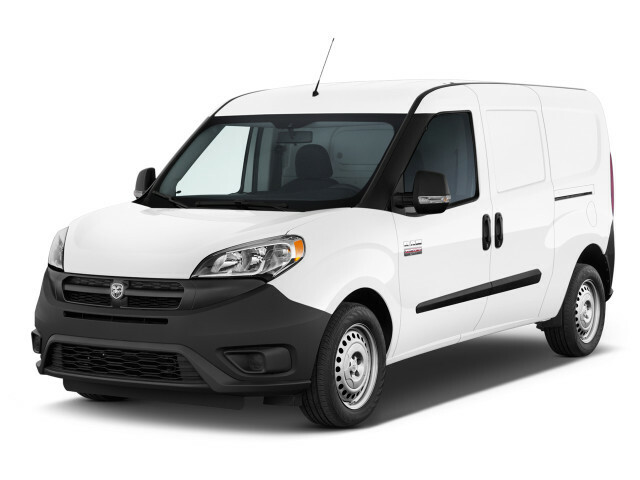 The 2018 Ram ProMaster City is not the best example of Italian design. Commercial vans aren’t intended to be pretty, but even with its Italian roots, the 2018 Ram ProMaster City doesn’t do much for us. The ProMaster City is actually an Italian design. Ram parent FCA leveraged its Fiat arm to rework the Fiat Doblo for the American market, but maybe they should have left it alone. Swept-back headlights and a matte silver grille that stretches into the front fenders give it a confused look up front. From the side, the ProMaster’s uneven window line sweeps upward for no apparent reason. It’s least offensive from the rear, where its dual side-hinged doors are flanked by plain tail lamps. 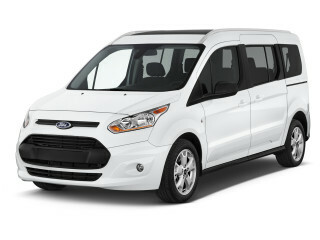 We’d rather have a forgettable design, like the Mercedes-Benz Metris and the Nissan NV200, than one that’s this odd. Inside, the ProMaster city is more conventional. A newly standard 5.0-inch touchscreen audio system sits up high on its dash and there are numerous cubby spaces afforded by its sweeping design. There’s not much to look at behind the front passenger compartment on Tradesman cargo variants. Wagon models have a second row of seats and lots of luggage space behind. The 2018 Ram ProMaster City suffers from a transmission that’s confused exactly when it shouldn’t be—around town. The 2018 Ram ProMaster City delivers better acceleration than some rivals, but its 9-speed automatic can feel confused just where it shouldn’t—around town. 2018 ProMaster City vans use a 2.4-liter inline-4 engine rated at 178 horsepower and 174 pound-feet of torque. It’s the same engine you’ll find in several small cars, like the Jeep Compass, and it uses a sophisticated 9-speed automatic transmission. The inline-4 has plenty of pep for urban use and there’s a little bit of reserve for highway passing. It’s a much stronger performer than the gutless Nissan NV200, but it can’t match the seamless torque of Mercedes’ admittedly much pricier Metris. Unfortunately, those specs are better on paper than in practice. The 9-speed fires off clumsy shifts, especially at low speeds, and it can be hesitant to downshift. We’d forgive its confused highway demeanor if it was better around town, where small vans like this tend to spend much of their lives. On the other hand, the ProMaster City rides well and its steering is direct and precise with little slack. It absorbs bumps with aplomb when loaded up with gear, although there’s a fair amount of road noise from the thinly insulated cargo and passenger compartment. Wagon models are a bit quieter due to their extra insulation, but no ProMaster City is a relaxed highway companion. For a small van, the 2018 Ram ProMaster City offers exceptional utility. The 2018 Ram ProMaster City makes the most of its small footprint, prompting us to add a point for its good cargo and small item storage. It’s hardly luxurious inside, though, with materials that reveal its low price point. The Ram ProMaster City is offered in just one basic shape, either with or without a rear seat and rear windows. Most ProMaster City vans are outfitted for cargo use and they offer nearly 132 cubic feet of maximum hauling space. For an extra cost, Ram offers numerous upfitter accessories to help users configure the vans’ blank slate cargo areas for their needs. Passenger models have decent room for three abreast in the second row and good access. There’s also an impressive amount of room behind the second row when it’s up, but it folds in a 60/40 split for additional utility. Front seat passengers have a good view out from firm, chair-like seats available in either cloth or hard-wearing synthetic leather upholstery. While there are plenty of spots to store clipboards, snacks, beverages, and the like both on the dash and around the fold-down sun visors, the Ram ProMaster City’s interior is composed of low-buck plastics. We don’t have enough data to assign the 2018 Ram ProMaster City a score. No crash-testing has been performed yet on the 2018 Dodge Ram ProMaster City and it isn’t available with some of the most high-tech safety equipment, either. Standard equipment on the Ram ProMaster City includes dual front airbags, front side-impact airbags, and curtain side airbags for either just the front seats on cargo models or both rows on the ProMaster City Wagon. A driver’s knee airbag is also standard. A rearview camera is newly standard for 2018, but rear parking sensors are optional on all variants. The 2018 Ram ProMaster City is available with lots of business-friendly options. If you’re a commercial buyer, you’ll find there’s a lot to like about the 2018 Ram ProMaster City. This year, a rearview camera and a 5.0-inch touchscreen audio system with Bluetooth are newly standard, which helps the Ram ProMaster City feel less like the bare bones work truck that it is. Power windows and locks and steering wheel-mounted audio controls are also included, but you’ll pay extra for cruise control. The SLT trim level adds a few goodies, like upgraded cloth upholstery, integrated navigation, full wheel hubcaps, and painted exterior bumpers. It’s not possible to dress up a Ram ProMaster City all that much, but some business-oriented features include a wi-fi hotspot, a choice of several window or block-out panel options for the sliding side and hinged rear doors, and even a taxi-prep package for ProMaster City vans destined for a life of yellow paint. There aren’t many luxuries on offer, but a fully loaded ProMaster City SLT can be equipped with heated front seats, a six-speaker audio system, and a leather-wrapped steering wheel. 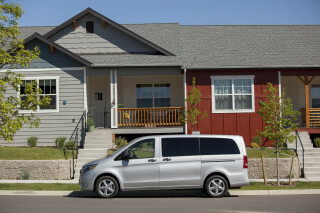 The Ram ProMaster City makes for a thrifty work van. Aided by its 9-speed automatic transmission, the Ram ProMaster City earns respectable fuel economy figures on the EPA’s test. The ProMaster City doesn’t have a stop-start system like some other small vans, but it is conveniently rated to run on regular unleaded gasoline.